Narrated by al-Bukhaari, 4463; Muslim, 2444. There is a report narrated by Ahmad (1691) from the hadeeth of Abu ‘Ubaydah, who said that the last words that the Prophet (peace and blessings of Allaah be upon him) spoke were, “Expel the Jews of the Hijaaz and Najraan from the Arabian Peninsula, and know that the most evil of people are those who took the graves of their Prophets as places of worship.” This was classed as saheeh by al-Albaani in al-Saheehah, no. 1132. And Abu Dawood (5156)and Ibn Maajah (2698) narrated that ‘Ali (may Allaah be pleased with him) said: The last words that the Messenger of Allaah (peace and blessings of Allaah be upon him) spoke were, “The prayer, the prayer! And fear Allaah with regard to those whom your right hands possess.” This was classed as saheeh by al-Albaani in Saheeh Abi Dawood. And there are other similar ahaadeeth. 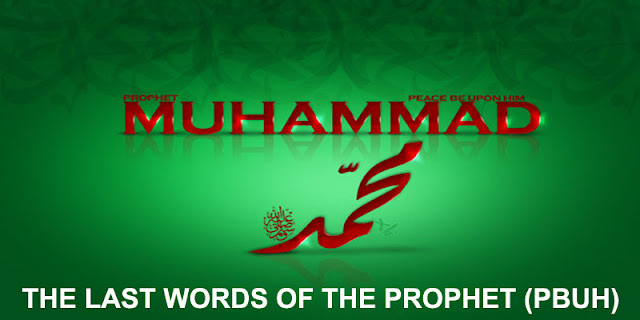 What is meant by these reports is that these are some of the last things that the Prophet (peace and blessings of Allaah be upon him) said, or they were the last pieces of advice that the Prophet (peace and blessings of Allaah be upon him) gave to his family and companions, and those who would be in authority after he was gone. These ahaadeeth are among the last things he said, but the hadeeth of ‘Aa’ishah is the last of all. Note: al-Suhayli said: the reason why these – “O Allaah, (with) the higher companions” – were the last words of the Prophet (peace and blessings of Allaah be upon him) is because they refer both to Tawheed and to dhikr in the heart. It offers comfort to those who are unable to speak (when dying), because some people may not be able to speak out loud for some reason, but that does not matter if their hearts are steadfast in remembering Allaah.